For me, lovely saturated colors and traditional style had always gone hand-in-hand. 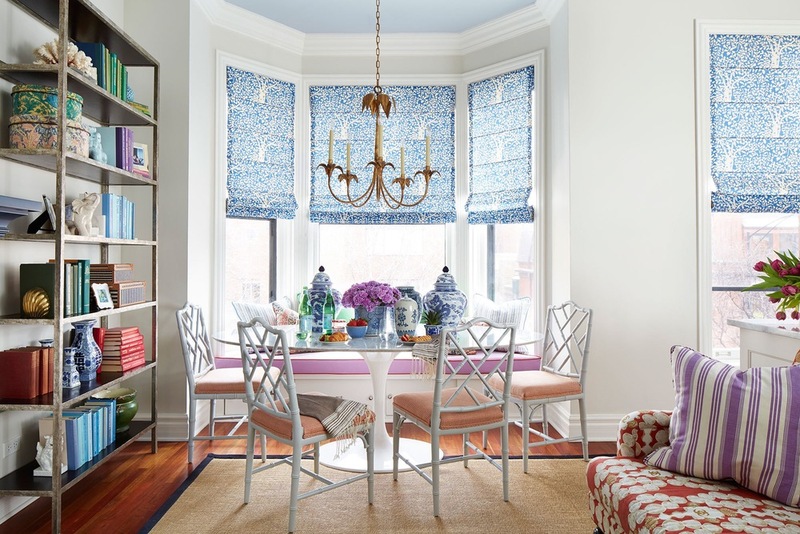 This preppy home in Chicago's Old Town neighborhood (where I was just wandering for fun yesterday, actually...) by local designer Summer Thornton, just featured in Lonny, definitely fits the bill for a colorful, traditional abode. Cheery, peppy, and filled with classic touches, this home is light and bright and perfect for modern family life in the heart of the city. The fireplace in this room was lovingly surrounded by a custom built-in - which was then painted a killer shade of navy (imagine what a snooze the more obvious choice of white would've been!) and matches the wonderful lantern. Obviously that couch-day bed with angular arms upholstered in cherry red is killing it. And I adore the crisp blue and white striped roman shades against the petite swirling pattern of the wallpaper. Oh, and, don't miss the little Brunschwig "Chenonceaux" cushion on the peacock chair. I am loving the boisterous combination of cherry red, navy blue, and grass green. In case you didn't get a close enough look at the wallpaper, yep, it's not a floral, it's strawberries. Obviously I'm a sucker for anything faux bamboo, and that true console (only two front legs and rests against a wall) desk is a total charmer, especially combined with that fab Bunny Williams chair. OOF, this kitchen and family room is killer! Essentially a tiny city kitchen, the space opens up wonderfully to an airy family room. Love those giant, brassy lanterns. Pretty sure they're the "Mykonos" from Circa. And how delightful is that love seat? So much better than putting some useless counter stools up against the island. Yes, yes, yes, people, it's my dream, a blue range with brass detailing! This guy is from Blue Star. A very sassy golden range hood is like jewelry for this room. Are those bookshelves to either side of the cooktop? Love the contrasting dark wood against the classic white cabinets. Cue up Sound of Music because here are a few of my favorite things! My go-to dining combination is on full display here, a Saarinen tulip table with faux bamboo Chippendale style chairs (and an adorable window seat banquette too!). Also a fanciful palm tree inspired chandelier, Quadrille's "Arbre de Matisse" fabric, and a whole slew of ginger jars!! There's so much friendly color in this space - lavender, coral, melon, sky blue, navy blue, hints of emerald - that you don't even notice the walls are white at first. And what ties it together? The rainbow of accessories on the bookshelves and that blue ceiling!! Also, are those navy Ferragamo flats in front of that bench?? I die. An emerald green mid century armchair, mixed with an Jansen inspired Jonathan Adler x-bench, and an uber prep brass floor lamp with a drinks table? Yes, please! Oh, and if you could top if off with an iconic Slim Aarons photo of C.Z. Guest at Villa Artemis that would be super. Agh, and one last arrow through the heart! A den clad in small scale navy Quadrille fretwork wallpaper, and a kelly green silk roman shade trimmed out in teeny blue tape trim. Fabulous. The neutral sectional is a cozy perch and a sturdy anchor to a room filled with dashes of vibrant color from an assortment of throw pillows and another classic Slim Aarons photo. A chic brass sconce with a pleated silk shade and little bouquet of blue hydrangeas never hurt anyone either. Even though this city home is jam-packed with saturated happy colors, classic traditional furniture, and a bevy of accessories, it still feels light, airy, and completely modern. A chic and cheerful respite from urban life!